Despite the fact that human and yeast divides a billion years of evolution, they have hundreds of genes with a common origin and functions. It turns out that about half of human genes are still able to replace the corresponding genes of the yeast. Thus predict substitutability on sequence similarity or level of gene expression was generally impossible. But, oddly enough, it was possible to predict the substitutability, knowing what the process involved gene. For example, the genes responsible for the initiation of DNA replication, were indispensable, and almost all of the genes in yeast sterol biosynthesis successfully replace human variant. For most genes of any organism (70-80%) can be found orthologs (see. The homologous DNA sequence) – with the same genes origin – the others, even fairly distant organisms. Orthologous genes are not required to perform the same function – in different organisms, they can take on different roles. Especially it has this gene duplication, followed by one of the copies can be freed from the pressure of selection and try his hand at something else. Nevertheless, the function of orthologous genes often still remains the same. Organisms usually no reason to change something that works and so, especially if it is something produced in large quantities. Therefore, the genes change slowly non-coding sequences, and is actively working genes – even slower. And yet, as far as could be different from orthologous genes for billions of years after they were separated from a common ancestor? Scientists from the University of Texas at Austin decided to check it quite straight-line method. They chose the 469 orthologous genes that were present in yeast and humans (and, moreover, in a single copy, in order not to complicate the picture), and check which of the human genes is still suitable for the yeast – after a billion years of separate development. First, for each of the selected genes were obtained a yeast strain in which the gene has been switched off or even removed entirely. The genes chosen for the experiment such that without them, the yeast could not grow. The resulting strains were introduced special yeast plasmid with the corresponding human gene that is either continuously worked or could be included with the addition of certain substances. Sometimes, expression of the human gene had to be adjusted to an appropriate protein did not accumulate in toxic amounts. As a result, almost half (47%) of the disabled or deleted genes of yeast was able to replace the human homologue. It would seem that a man is quite far away from the yeast – but nevertheless a considerable part of his genes tested are still suitable for yeast. It was interesting to find out what is common in the human genes and yeast that were replaced. The researchers evaluated 104 features that could affect the ability of genes to replace each other. Among them were the sequence similarity, protein and RNA accumulation and their size, the rate of transcription and translation, and many other parameters (characteristics were taken from the databases of biological KEGG – Kyoto Encyclopedia of Genes and Genomes; Fig. 1). As expected essential had sequence similarity, but in most cases it is not possible to predict whether the gene will suit a person to replace yeast orthologue. Unlike most genes (less than 20% of the amino acids encoded by coincidence) could not really replace the corresponding genes of yeast, and the most similar (more than 50% of the amino acids encoded by coincidence) most suited as a replacement. However, most studied gene into the intermediate area – from 20 to 50% similarity encoded amino acids – and the similarity of sequences can not be predicted, whether human protein suitable as a substitute for the yeast. Unexpected is that substitutability gene could not be predicted and the level of expression – in fact the more active the gene works, the more risky to change it and the slower it evolves. One would therefore expect that the highly expressed gene, the more likely it will be able to replace the orthologous gene is a member of another species, but in general, this pattern was not observed. But also unexpectedly substitutability orthologous genes can be predicted by knowing the process, which involves their products. Thus, the human genes involved in the initiation of DNA replication, did not fit the yeast and nearly all of the sterol biosynthesis genes (see. Sterol) – catalyzing transition acetyl coenzyme A cholesterol in humans and ergosterol (see. Ergosterol) yeast – approached. Interesting was the pattern with the proteasome genes – a molecular machine to destroy unwanted proteins. Proteasome is composed of several proteins rings stacked. External rings are composed of alpha subunits, and they are controlled by the gate of the proteasome and that fall inside it. 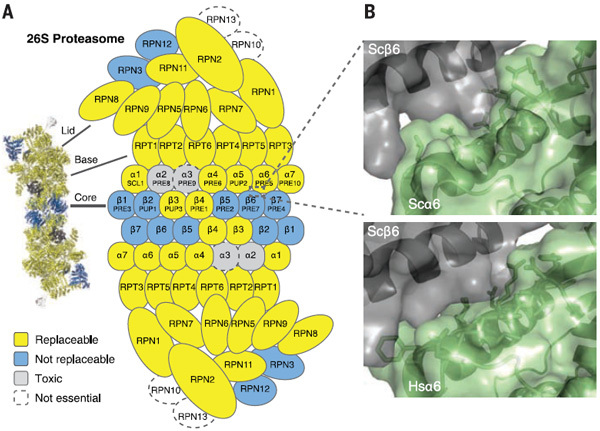 Ring in the middle consists of beta-subunits are capable of hydrolyzing proteins that fall into the proteasome. All the genes encoding the proteins alpha-subunit appeared interchangeable, and most of the genes of the beta subunit was irreplaceable (Fig. 2). This protein-essential gene products interact Mezhuyev themselves. Scientists have tried to replace the yeast proteasome genes orthologous genes of other organisms in addition to humans. And, as in the case of human genes, foreign genes can replace the alpha subunit of the yeast proteasome, but could not replace the beta-subunit. It turns out that part of the proteasome were subjected to different selection pressures. Here again we can see the separation Feature: proteins that are involved in the hydrolysis proved indispensable, and the proteins that make up the entrance to the proteasome, can be replaced by the corresponding proteins of other organisms. Judging by the results of this work, if any genes begin to change, they prefer to do it in the company of close colleagues. Indeed, proteins involved in the same process, it is necessary to adapt to each other, so that the system as a whole remained working. In addition to the fundamental interest (to understand how proteins are parted similar human and yeast), and work has important practical results. After all, by leaps and bounds, both in single-celled organisms that multiply rapidly, convenient to experiment. However, research on yeast is difficult to extrapolate that has the biggest practical importance – for human biology. Judging according to scientists, it is theoretically possible to obtain yeast strains with whole metabolic pathways consisting of human enzymes. In such “humanized” yeast is convenient to study human proteins and to test potential drugs.